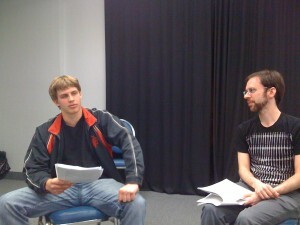 I am directing The Second Last Manon Earth by Jordan Hall for Monkeyman Productions’ Banana Festival. The good news is that the play is great. Also good news is that now I get to play Left 4 Dead 2 and call it “research”. Not so great is the fact that I’m coming in as a ringer. Basically, things came up and the director originally slated to direct the play was unable to do so, and the Monkeymen called me. And (to quote 24) WE’RE RUNNING OUT OF TIME! But the best news is that the cast is great. Tim Nussey, Melissa Zaccardelli, and Jack Morton are pulling the play together and despite the short time, and really finding some great stuff in the scenes. In a short amount of time, we’ve managed to make some good choices about the characters, flesh out their histories, and get the play blocked. Now we can start to find the nuance in the scenes, and get the dialogue really moving. Once thing I’ve noticed about not having a lot of time is that you basically have two options: you can try and hurry, worrying that if you don’t rush through everything that you’ll run out of time. Or you can work slowly, making sure that you work carefully. It seems that best option is to work slowly, taking your time, and ensuring that you work through each moment, not glossing over anything. This is the best use of the actor’s time. Working slowly like this means that everything gets its moment, and actually helps the actors to learn their scenes. Its been an important lesson to learn.